Micronutrient deficiencies threaten productivity, development and health of millions of people worldwide. For example, approximately half of the child population in India is affected from chronic malnutrition, and vitamin & mineral deficiencies. Along with micronutrients supplementation and diversification in diets, enriching the regularly consumed food such as rice with minerals & vitamins is an effective solution for alleviating the issue. This has led toward the fortification of rice, which is emerging as a sustainable & cost-effective measure for providing nutrition to people globally. Nearly 2 Bn people across the globe currently suffer from mineral and vitamin deficiencies, posing devastating impact on these people as a result. Impaired motor and cognitive development among children, reduced immune response, lower capacity in performing physical work, high morbidity and mortality among newborns, adults, & mothers, and growth retardation are some of the major impacts of nutrition deficiencies. As rice is a globally consumed food, and staple for in several emerging countries such as China and India, fortified rice has emerged as the key to reduce the burden of malnutrition. Several demographic experiments and studies across the globe have imparted effectiveness and safety of consuming extruded fortified rice, and have depicted significant improvements in the vitamin and mineral status of people. Over the past few years, many initiatives have been spearheaded by the rice industry and development partners for providing fortified rice with the help of safety net programs and the open market. For example, government of India in coordination with WFP and PATH has distributed fortified rice through several welfare schemes, particularly via Mid-Day Meal across some of its states. In line with this, the U.S. Food Assistance Agencies have sought diversification of their portfolio regarding value-added nutritional food produced within the region’s origin commodities for the global nutritional and food aid. Fortified rice has remained a key component of the programs carried out by these agencies. These instances have led to high production of fortified rice across the globe. According to Transparency Market Research’s report, the global fortified rice market will register a splendid growth during 2017 to 2026. Revenues from global sales of fortified rice will exceed US$ 25,000 Mn by 2026-end. Countries of Asia-Pacific excluding Japan (APEJ) comprise a large & centralized rice milling industry, which facilitates implementation of rice fortification. These countries have large safety nets, which supply subsidized fortified rice to population under poverty line as they have a good channel to reach people in dire need for nutrition. APEJ will therefore continue to be the largest market for fortified rice in the near future, in terms of revenues. North America and Latin America will also remain leading revenue contributors to the global fortified rice market. Fixed costs such as initial capital investment for facilities and equipment, are basically influenced by the selection of technology for fortified rice production. Coating & Encapsulation technology, among various technologies, requires relatively lower capital investment. This technology is therefore projected to witness a relatively faster adoption in the fortified rice market through 2026. However, in terms of revenues, drying technology will continue to lead the global fortified rice market. 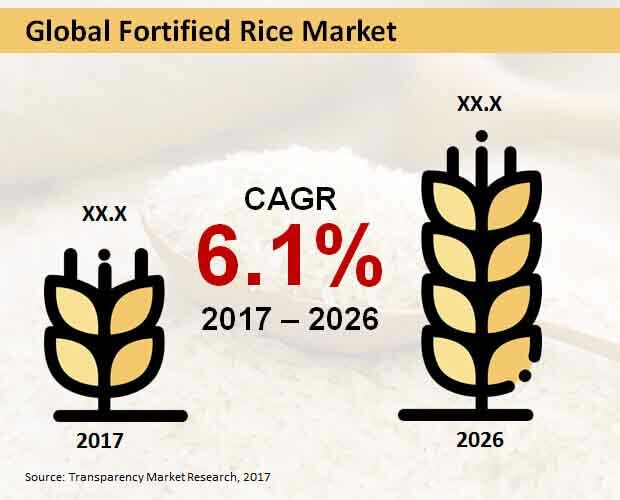 Leading players in the global fortified rice market from the private as well as the public sectors are focusing on establishing a coalition for underpinning the utilization of fortified rice and addressing growth barriers to its implementation across the globe. Key market players identified by the report include Cargill Incorporated, Bunge Limited, Bühler AG, BASF SE, General Mills, Inc., and Wilmar International Ltd.